Those outside the parliamentary game clamour to be let in. And they are, on the promise that they will stick to the rules. Once in the ring, they go along with the rules as long as it suits them. When it doesn't suit them, they first change the rules of the game and then the game itself. This is what happened in Sri Lanka, and this is what is happening in Nepal. The guns fall silent and the peace process gets frozen into a state of non-war. The Maoists have forced the seven parties to put off indefinitely the already-postponed elections. The elections are now unlikely before May 2008 and this is a long period during which je pani huna sakchha. In this twilight zone there is no immediate return to warfare, everyone is on a knife-edge. The one who blinks first loses. The rebels can hold out indefinitely, consolidate their gains, mobilise men, resources and firepower, and await that tipping point in the strategic balance when the endurance of the parliamentary parties would break. Whatever the government does, confrontation or negotiations, the rebels have the upper hand. It may be premature to ask whether the Maoists will take up arms again like the Tamil Tigers, but that is the tried and tested route in insurgencies everywhere. The peace agreement last year opened the doors for the Maoists to enter the mainstream political arena with a place in parliament and government subject to their renouncing the armed struggle and laying down weapons under UN supervision. At every stage the Maoists kept creating new conditions and raising new demands. The Maoists knew that only Girija Koirala could deliver on the agreement and also that once on peace process he would have to go the extra mile to make it work. His legacy of peace, democracy and elections rested on it. Like the monarchy, the Maoists are fearful of democratic elections because the outcome is unpredictable. Their power in government and on the ground would be circumscribed if not vastly curtailed, compared to what they enjoyed during the war. When the Maoists signed the peace agreement, they agreed that the constituent assembly would be elected on a mixed proportional system and decide the fate of the monarchy. Yet, their 22-point charter demanded that Nepal be declared a republic by the present interim parliament and elections be held under a full proportional system. Declaring Nepal a republic before the elections would be lacking in popular legitimacy, and by raising this issue to such a pitch, the Maoists have brought the monarch back to the political center-stage. By repeatedly asserting that he was striving for a bigger role, the Maoists have drummed up sympathy for King Gyanendra and reinforced popular cynicism against mainstream parties. More than the demand for a republic, their insistence on a change of electoral procedures just weeks before the nomination deadline was calculated to wreck the election timetable. They knew that this demand could not be met because it was impossible to make the systemic switch in the time. It doesn't matter what parliament decides anymore, the Maoists have derailed elections and now can be held only at a time of their choosing. The message is that the Maoists will call the shots, and that they are not bound by the agreements to which they are a party. 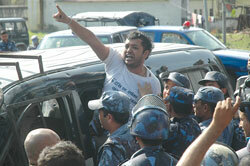 This bodes ill for Nepal and is the most serious setback to multiparty democracy since the elections in 1991. The political parties are forever thwarted by non-elected forces, be it the monarchy or the Maoists. Unless Nepal breaks out of this pattern, representative democracy will remain the mirage it has been since the first movement in 1950. Shastri Ramachandaran is an Indian journalist and writer and co-author of the book, State of Nepal.